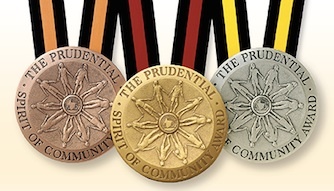 Prudential Spirit of Community Awards Applications Due November 8! Tuesday, November 8 is the deadline to apply for the Prudential Spirit of Community Awards. If your Girl Scout made a difference through volunteering over the past year, she could win $1,000 and a fabulous trip to Washington, D.C. by applying for a Prudential Spirit of Community Award! This award recognizes young people by encouraging volunteerism and drawing attention to the good work being done by the youth in our community. All girls in grade 5-12 are eligible. Created in 1995 by Prudential and the National Association of Secondary School Principals (NASSP), the program honors middle level and high school students for outstanding service to others at the local, state and national level. So far, it has recognized more than 115,000 young people who’ve made a difference – and inspired countless others to consider how they might contribute to their communities. Local Honorees receive a Certificate of Achievement from their schools or organization. Those Local Honorees who qualify (26 hours of service for ages 10 and younger, 50 hours for ages 11-15, and 100 hours for older students) also receive the President’s Volunteer Service Award. Distinguished Finalists receive an engraved bronze medallion, and other state-level runners-up receive Certificates of Excellence. State Honorees receive an award of $1,000, an engraved silver medallion, and an all-expense-paid trip with a parent or guardian to Washington, D.C., for national recognition events. National Honorees receive an additional award of $5,000, an engraved gold medallion, a crystal trophy for their schools or nominating organizations, and a $5,000 grant from The Prudential Foundation for a nonprofit charitable organization of their choice. Find out more and submit an application . Questions? Contact: Marcy mreed@girlscoutsccc.org . Refer-A-Friend Volunteer Promotion 11/15/16 to 12/15/16 – EARN $50 ONLINE SHOP CERTIFICATE! REMINDER: Take the 2016 Girl Scout Challenge!